NCL has three resolutions of map outline databases available through the mpDataBaseVersion resource. Note that the behavior of this resource has changed in NCL V6.4.0! Setting mpDataBaseVersion to "MediumRes" allows you to optionally set the mpDataSetName resource to control how many outlines you get and at what resolution. 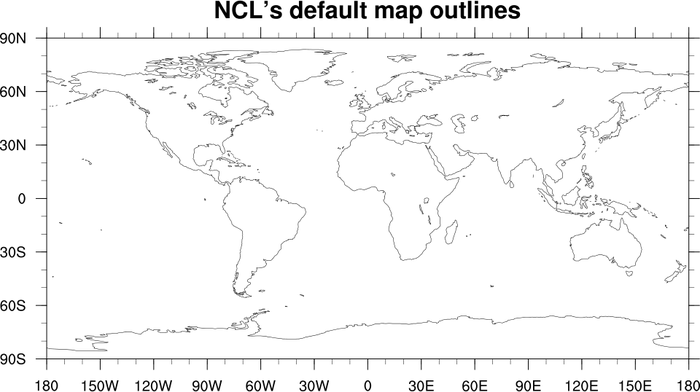 See example mapoutines_7.ncl below. "HighRes" - a high-resolution coastline database; cannot be used for global maps as it will not be drawn correctly. Requires a "RANGS" database that you need to download and install. Go to the RANGS page for more information. 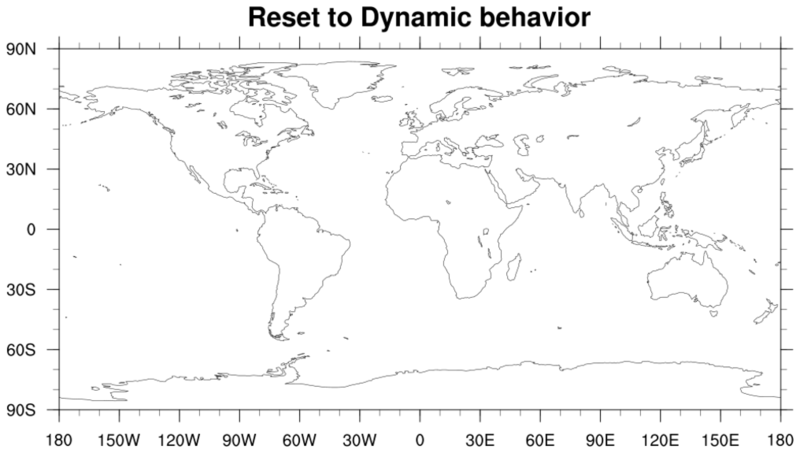 "Dynamic" - new default behavior introduced with NCL V6.4.0; the LowRes database is used unless either of mpFillBoundarySets or mpOutlineBoundarySets is set to something other than "Geophysical", in which case the MediumRes database is used. (see example 6 below). To turn NCL map outlines on or off, set the mpOutlineOn resource to True or False. You can also turn map fill on and off by setting mpFillOn resource to True or False to turn on/off map fill. 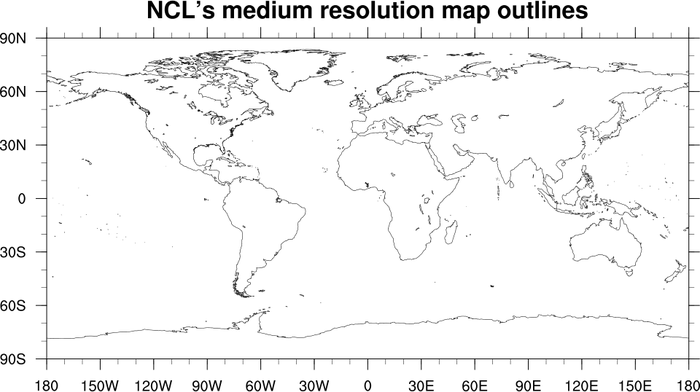 In some cases, NCL's map outlines may not give you the outlines or resolution you desire. We recommend that people use shapefiles, which you can find numerous, free examples of using a web browser search. 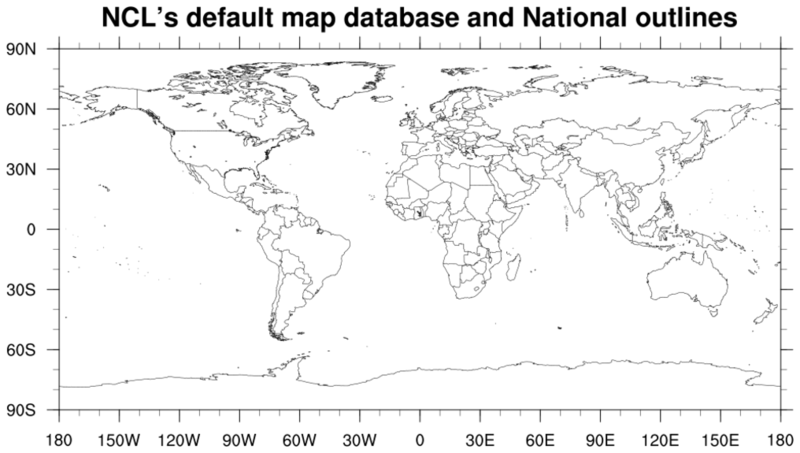 The Global Administrative Database (GADM) (http://www.gadm.org) offers various levels of outlines for many countries in the shapefile format. 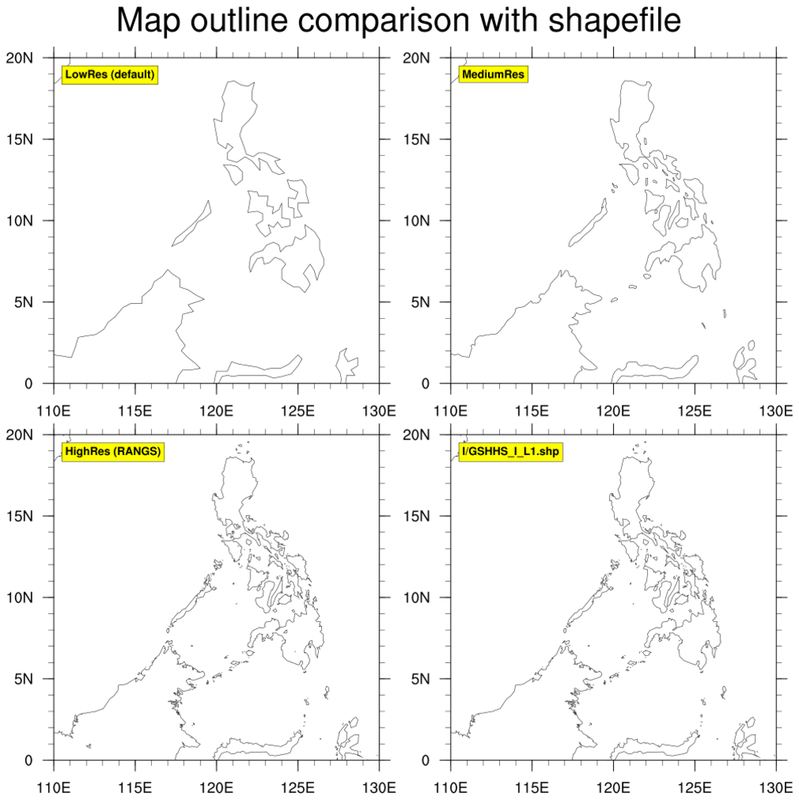 See the shapefiles examples page for more information. 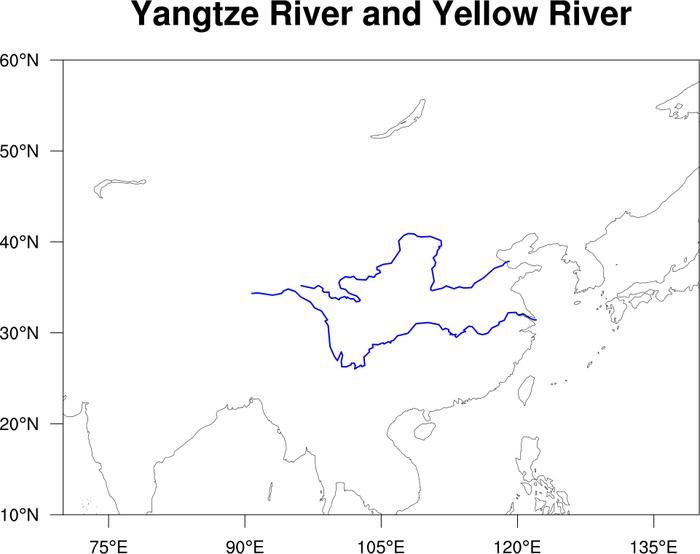 mapoutlines_1.ncl: Shows how to draw the Changjiang and Huanghe Rivers on a zoomed in map of China, using gsn_add_polyline. 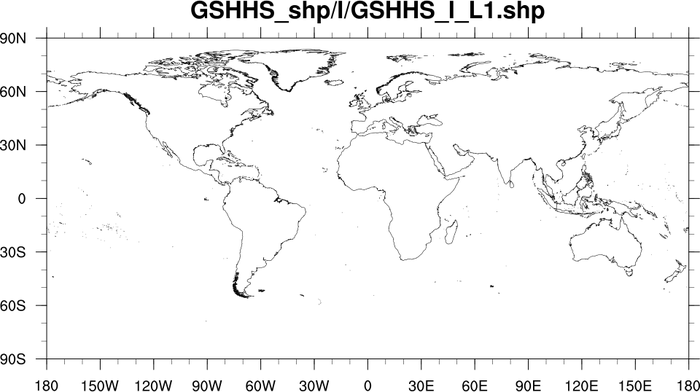 The script was contributed by Dr. Xiao-Feng Li of the Institute of Atmospheric Physics (IAP), Chinese Acadmey of Sciences (CAS), modified from a GrADS code from Dr. Pinwen Guo (NUIST) and NCL code of Dr. Jun Cheng (NUIST). 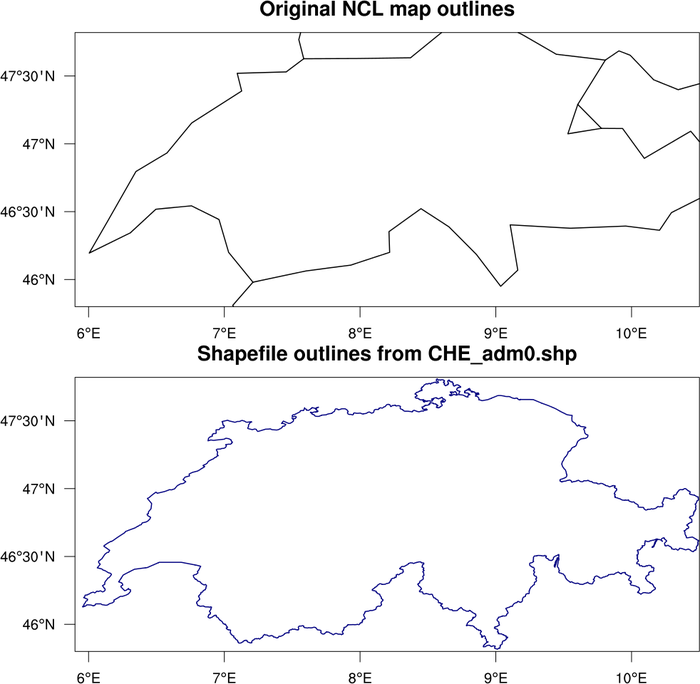 mapoutlines_2.ncl: Shows how to draw outlines of Switzerland using shapefiles downloaded from http://www.gadm.org/country. This example draws a panel plot, comparing NCL outlines with shapefile outlines. 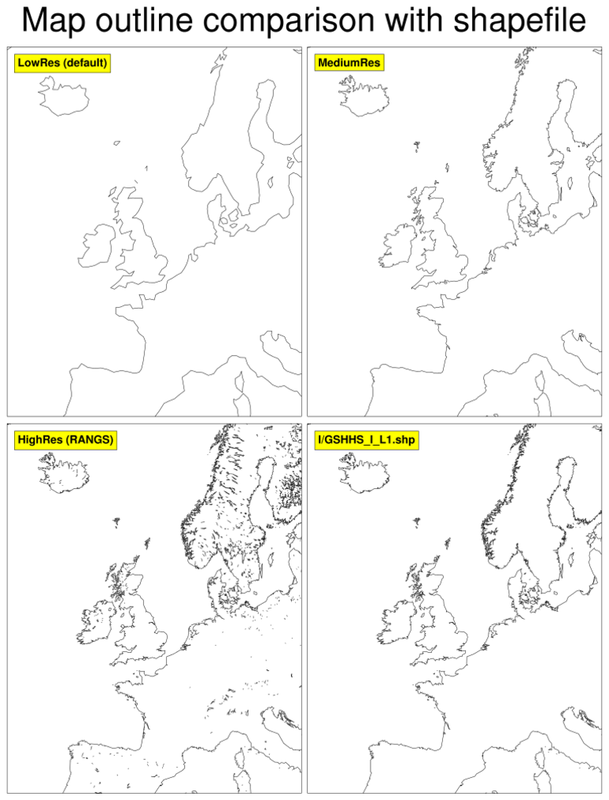 mapoutlines_3.ncl: This script demonstrates the difference in resolution between the three available map databases in NCL, via a zoomed in map of Norway and Sweden. 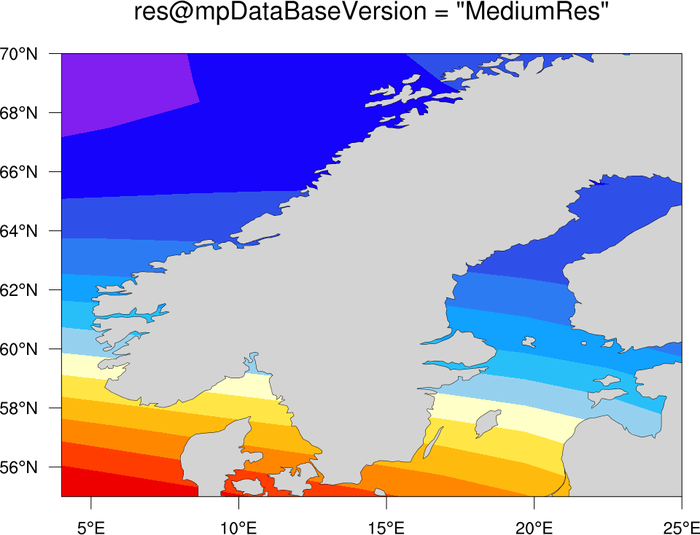 mpDataBaseVersion is used to set the database that NCL uses to draw the basemap. By default, mpDataBaseVersion is set to "LowRes". 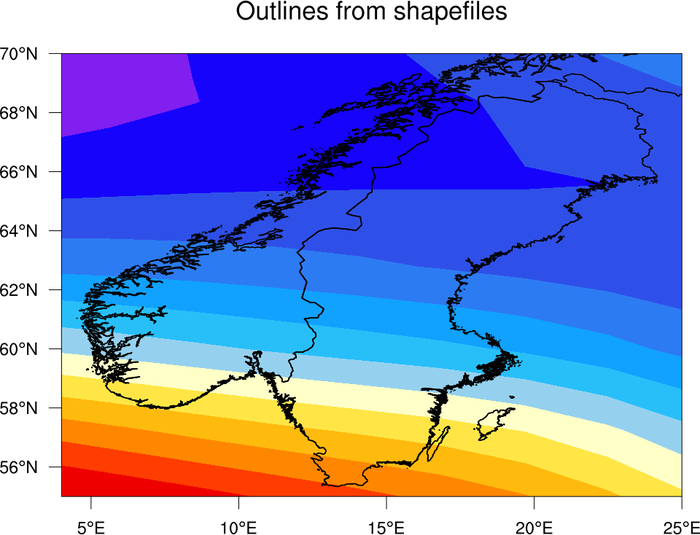 mapoutlines_4.ncl: This example draws the same contours as the previous example, but uses gsn_add_shapefile_polylines to attach outlines read in from Sweden and Norway shapefiles downloaded from http://www.gadm.org/country. mapoutlines_6.ncl: This script illustrates new default map database behavior introduced in NCL V6.4.0, and shows how to override the defaults. 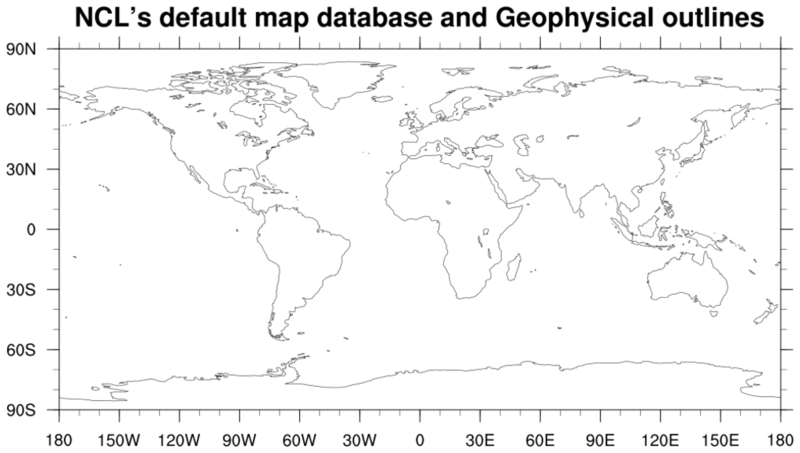 As with prior versions of NCL, the default map database is LowRes, unless either of the boundary-set resources mpFillBoundarySets or mpOutlineBoundarySets are set to anything other than "Geophysical", in which case the MediumRes database is used. This represents a balance between performance and accuracy for common use-cases. 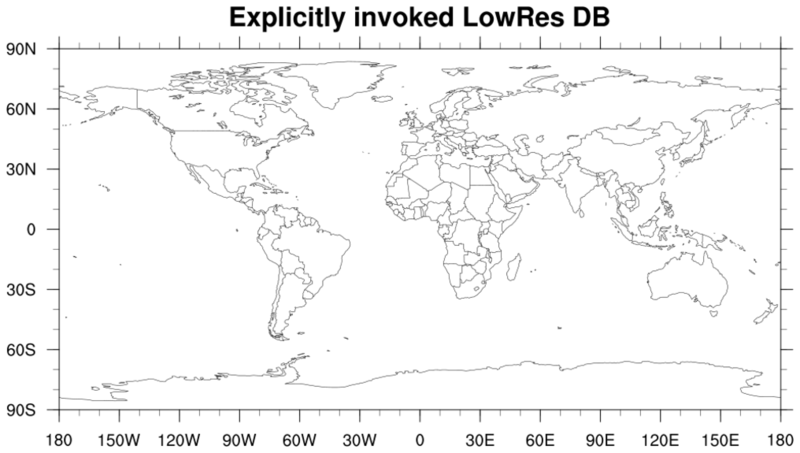 The LowRes database is more than adequate for global scale maps depicting land/ocean boundaries, whereas the more detailed MediumRes database is preferred for its more up-to-date political boundaries. The default behavior can be overridden by explicitly setting mpDataBaseVersion to the desired database name. 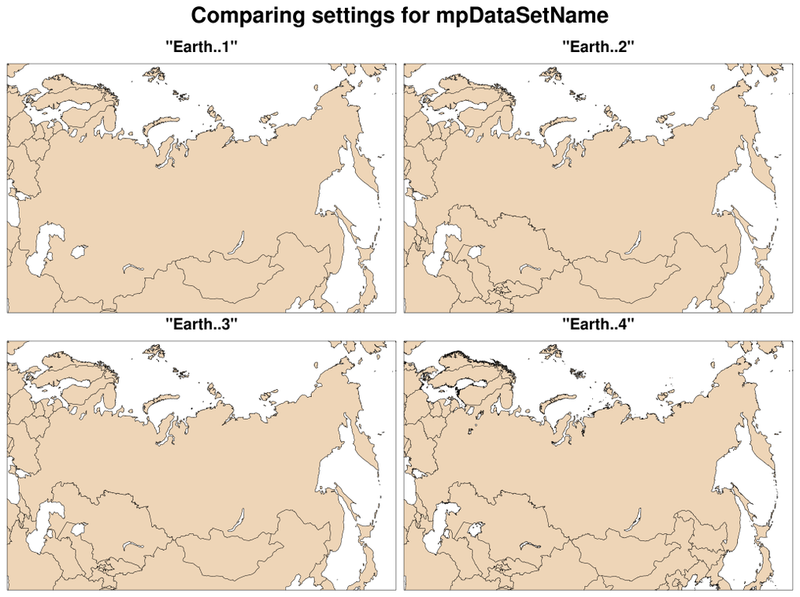 mapoutlines_7.ncl: This script compares the four possible settings for the mpDataSetName resource, which gives you more map outlines and better resolution, depending on the area of the map you are focused on. In order to use this resource, mpDataBaseVersion must be set to "MediumRes" (which is the default in NCL V6.4.0 if you zoom in on a map). 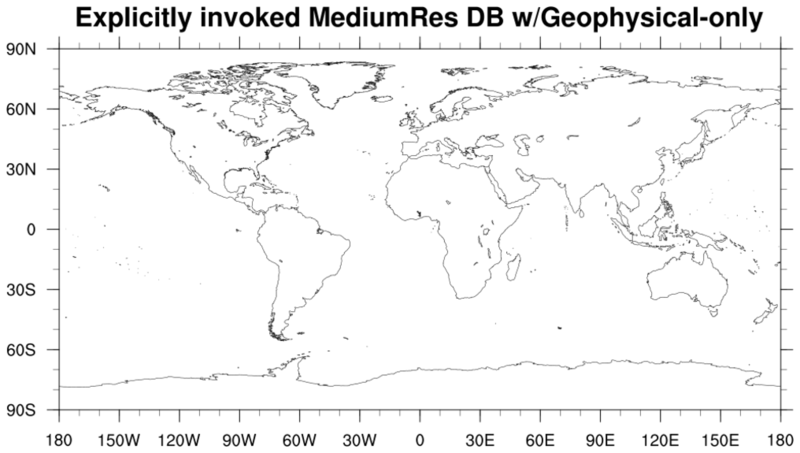 Also, in order to see all the possible boundaries, you must set mpOutlineBoundarySets to "AllBoundaries", otherwise you will only get geophysical outlines. 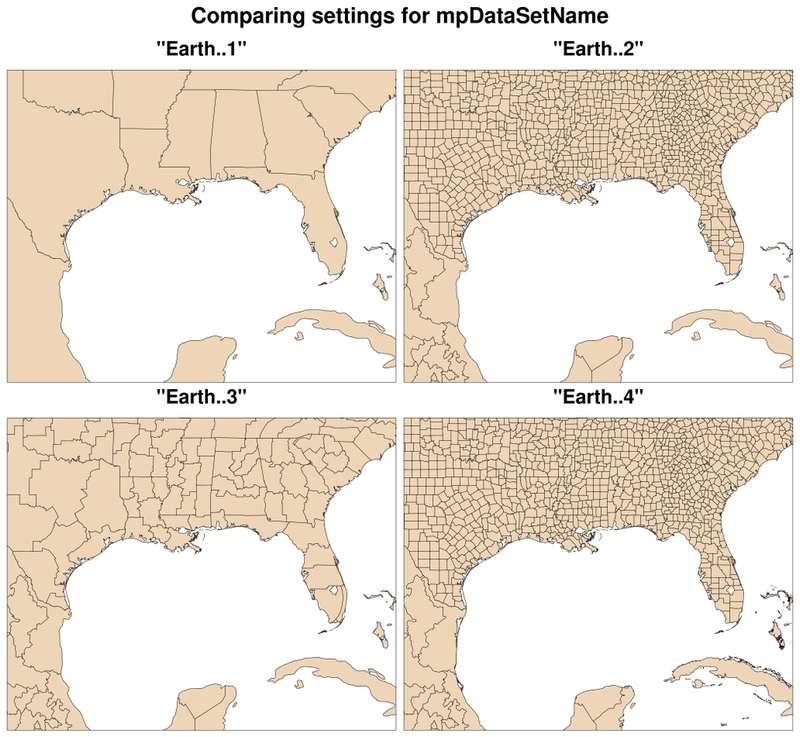 "Earth..1" - This is an older dataset that contains geophysical and political boundaries including the states of the United States. "Earth..2" - This is the default value. It is similar to "Earth..1" except that it contains the country Eritrea, and several countries resulting from the breakup of the USSR that were not included in "Earth..1". It also contains the provinces of Canada, the states of Mexico, and all the counties in the United States. "Earth..3" - Similar to "Earth..2" except that the United States counties are replaced with climate divisions within each state. "Earth..4" - Similar to "Earth..2", but has about 10 times as much detail and is much more accurate. For more details, see the documentation for mpDataSetName. 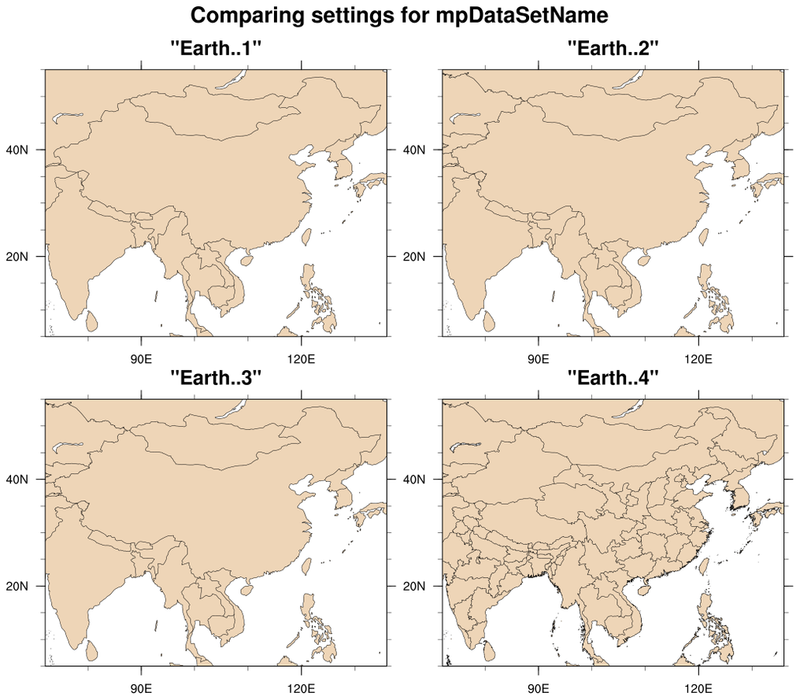 The four panel plots show the effect that these four values have on the outlines when you zoom in on different parts of the world. 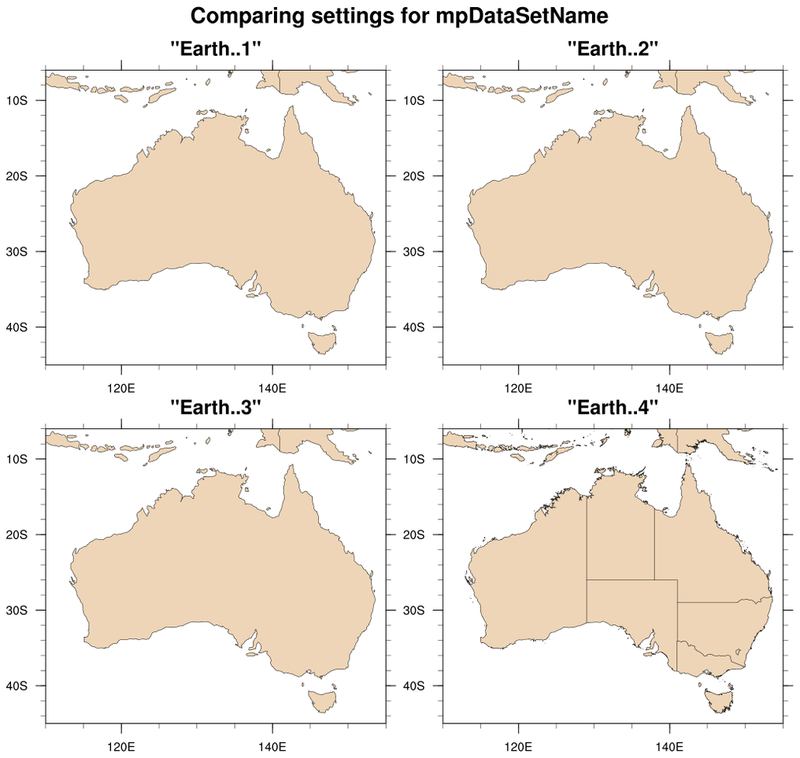 Note that the maps for "Earth..2" and "Earth..3" look identical for all maps except the United States.